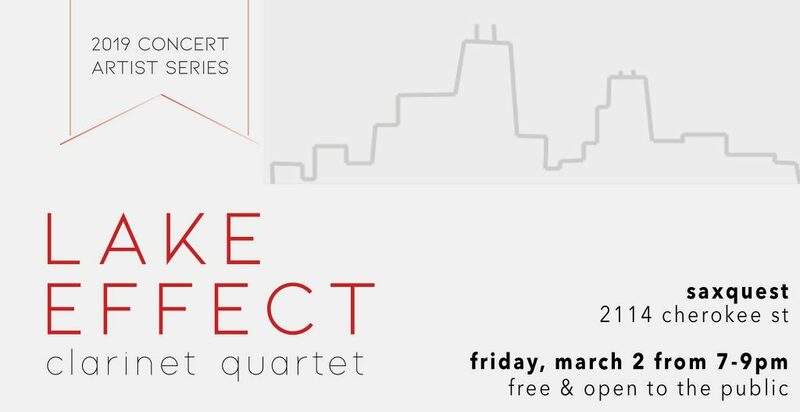 Clarinetquest is delighted to announce a re-scheduled performance featuring the nationally-renowned Lake Effect Clarinet Quartet on Friday, March 29. This event is FREE and open to the public!! It will be at our store on Cherokee St Friday evening from 7pm – 9pm. As Vandoren artists, LECQ concertizes and presents clinics throughout the Midwest. Lake Effect has performed at the International Clarinet Association’s Clarinetfest (2017), Vandoren Clarinet Ensemble Festival (2013), presented at the Vandoren booth at the Midwest Band Clinic (2013, 2014), and was invited to compete in the quarterfinal round of the 2012 Fischoff National Chamber Music Competition in South Bend, Indiana. Additionally, the quartet is in residence with Chicago Composer Jonathan Hannau at the Avaloch Farm Music Institute (2017).